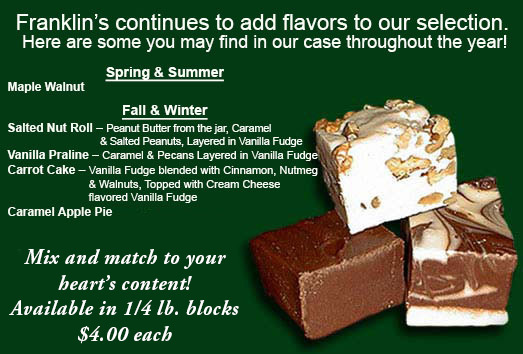 Take a bite of Franklin’s Freshly made fudge and taste the magic! The creamier texture and the bold and rich flavors are a result of better quality and a large volume of tasty ingredients. We use only the very finest sugars and cocoas, as well as real butter and cream. Each tray of fudge is loaded with authentic and recognizable favorite treats, spices, and extracts, rather than unrecognizable flavorings found in others brands. Franklin’s General Store is the largest, single store producer of fudge in New England and continues to create every batch of fresh fudge with loving care. Come in for your FREE TASTE! Oh My God! ….Oh My Gosh! ….Wow That’s Good! ….You Gotta Try This! ….Absolutely Delicious! ….It’s So creamy!